I would love to install White Carrara marble kitchen countertops. It's beautiful! Your website has been extremely helpful, but you say not to install marble counter tops in the kitchen. I definitely want white countertops. What should I do? I'm glad you find our website helpful. We want to give you the best unbiased info for all your countertop needs. Of course, marble has been used for kitchen countertops for centuries so it is a proven long-lasting surface. But this comes with some caveats. Historically no one ever made a fuss the way marble would age with use showing etch marks, stains, scratches, etc. The surface would last forever but marble will patina with age and use. This was expected. These days homeowners love the look of a freshly polished, unblemished and beautiful marble countertop. And rightly so. They can be stunning. And here's where trouble enters the equation. Marble countertops are much more sensitive to etching (dull marks in the marble polish) than granite. Kitchen countertops just get way too much abuse and constant exposure to acidic foods and drinks. Which means a constant battle with dull spots from etching. It would drive you nuts! So, the reason marble countertops are not recommended for the modern kitchen comes down to looks and maintenance. If you want to maintain the pristine look of new marble countertops, then you must expect a lot of maintenance. It isn't that marble is no good for kitchen countertops, it's just that they demand a lot of attention and work to keep them looking magazine-worthy. It is often suggested to install marble kitchen countertops with a honed/matte surface as etch marks are not as visible in a honed finish, but they still occur just the same and are noticeable. And really it's easier (in my opinion) to restore etch marks on a polished finish than on a honed finish since you can use a DIY etch remover product that makes the job pretty easy. Also, a honed finish is more porous and prone to staining than a polished finish, though, staining can be effectively controlled with a sealer. Basically, marble kitchen countertops are troublesome. You'd need to learn to remove stains and etch marks (which is not hard but it's extra work) or you'd want to have the marble repair guy on speed dial. Why go through the hassle? Now if you are a serious baker, then marble is considered the best surface for rolling dough, but even then I would only do a section or an island and not the whole kitchen countertop. 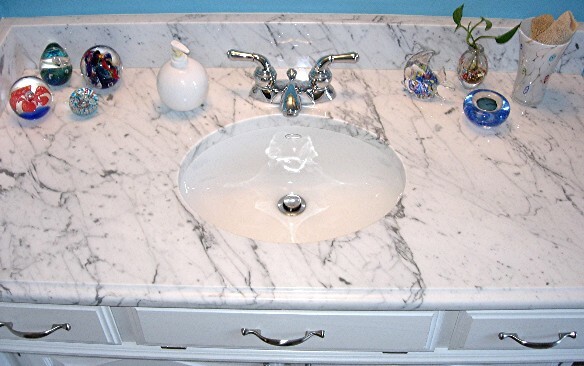 Look at white granites or other Carrara marble alternatives. You will still have to apply a granite sealer once in a while (every 2-5 years) but no big deal. Granite will stand up to your family no problem. Also, Silestone, Zodiaq, Cambria and other quartz countertops have some nice whites. Follow the links from the "Quartz" page button up on the left. Quartz performs just as well as granite, you just don't have the range of color/pattern choices that you do with granite. You may consider Corian, but I'd much rather put in granite or quartz... they make far better kitchen countertops. We've installed marble kitchen countertops before at the insistence of the homeowner, but not until we tried to talk them out of it ten different ways. Think of marble like fine wood furniture... it's beautiful, but you have to baby it. So, save the white Carrara for a powder bath.